Want to start trying some common yoga moves? Check out 10 common yoga poses below for information on how to execute each pose and learn their purpose! 1. 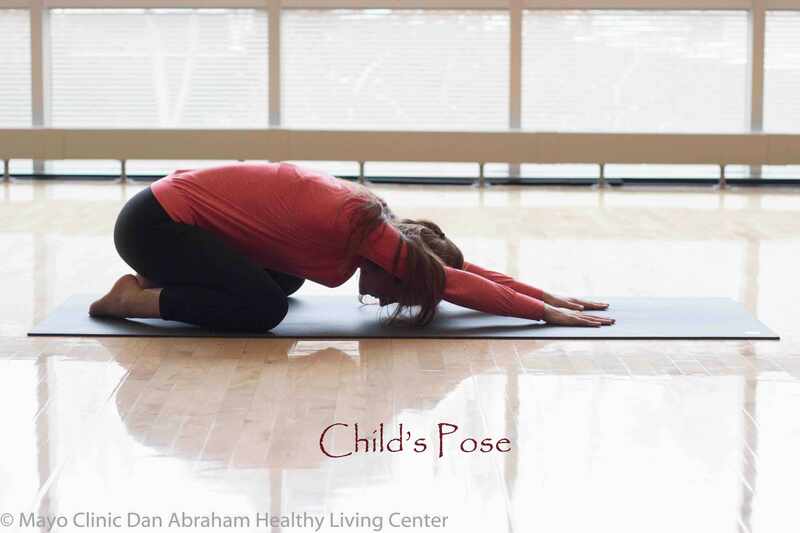 Child’s pose is an important yoga position to take the opportunity to find your breath. Relax into the ground by bending the knees and hips, stretching the shoulder muscles and resting the head on the floor or in a lowered position. Stay in this pose for up to 30 seconds. 2. Warrior 2 is a lengthening pose. Notice the front knee is in a 90 degree angle, while the back leg is extended with the foot pointing outward. Arms are extended toward the front and back, and the focal point is just beyond the fingers on the front hand. 3. 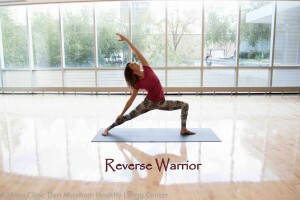 Reverse Warrior is similar to its sister pose, Warrior, yet it includes a lateral stretch or bend. Rather than the arms being extended front and back, one arm will extend upward, while the other lightly supports the body by grasping the lower leg. There will be a Warrior workshop offered at the DAHLC on October 18th. For more information, check out our website or ask the front desk! 4. 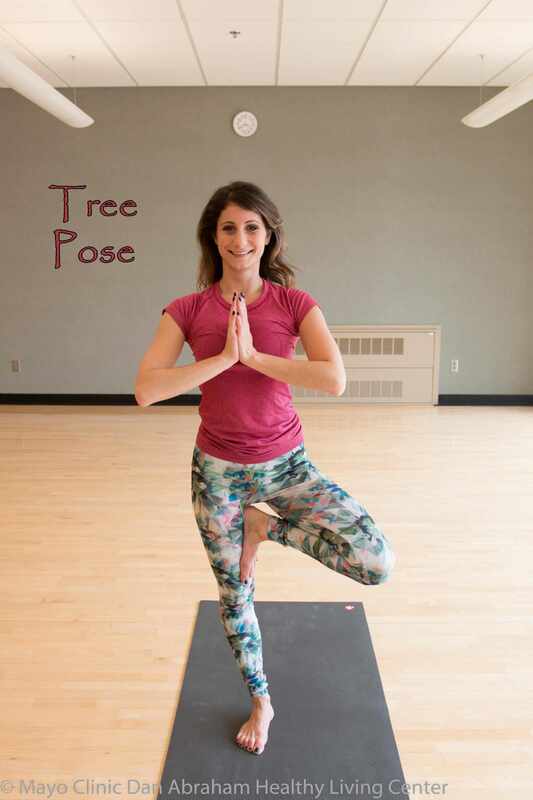 Tree pose can be a challenging pose for balance, but much of the challenge comes with trying to maintain focus. There is so much to balance in our daily lives, and yoga presents a physical way that we can master that balance with our bodies. 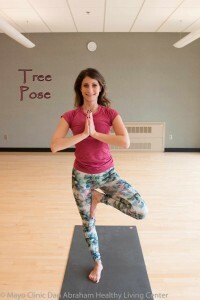 Tree pose acts as an effective hip opener and core stabilizer. You can always lower the bent leg if balance is an issue. Remember to refer to the instructor for modifications of the tougher yoga moves. 5. 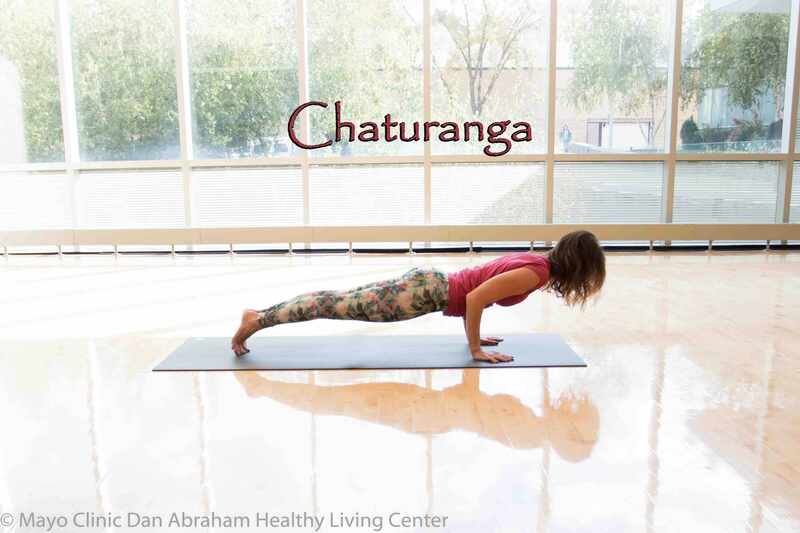 Chaturanga is a more challenging yet common yoga pose used in the more experienced yoga classes. The pose is similar to a push-up position, except the positioning of the hands are slightly different. Bottom should be down and in a flat alignment with the back. If you feel comfortable, try this pose on a mat surface and hold for a couple seconds and then slowly lower yourself toward the ground as if performing a push-up. Then, lift yourself back up to the original position. This is a full body strengthening pose. 7. 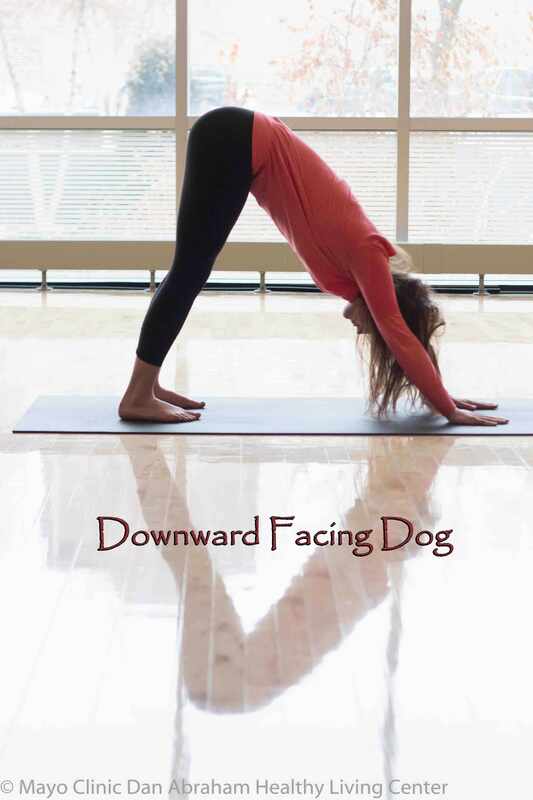 Downward facing dog is probably the most popular yoga move in many yoga classes around the country. 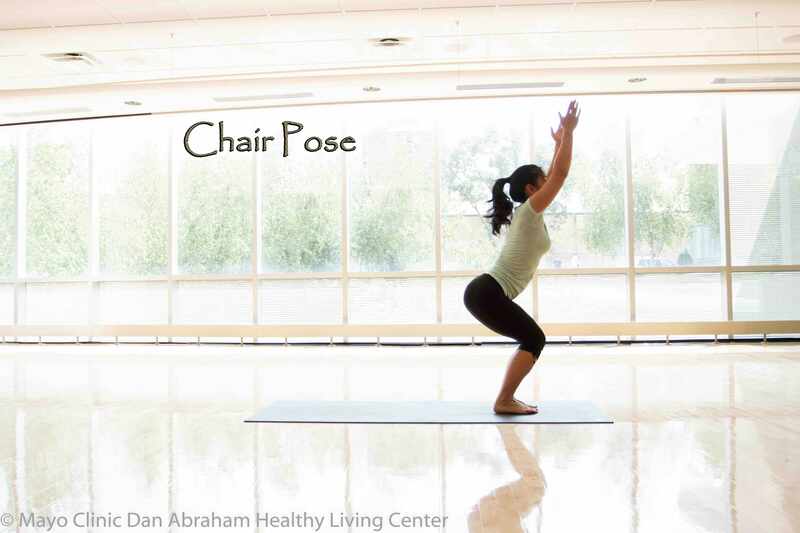 The pose helps strengthen the shoulder and upper back muscles as well as stretch the calves and hamstrings. If this pose places too much pressure on the wrists or shoulders, you can modify by going down to your elbows. 8. Rag doll helps elongate the spine. It is essentially a forward fold, wherein the knees are slightly bent with the upper body folding forward, arms hugging and head down. If desired, you can slowly sway side to side while in this position. Emphasize relaxing and being loose (like a rag doll) in this position and finding your breath. 9. 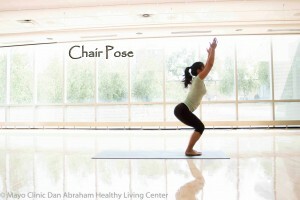 Chair pose is a nice hamstring extender and core stabilizer. Feet are close together and the bottom is slowly moved into a seated position, as if sitting in a chair. Arms move upward above the head, and the eyes look forward. Try holding this pose for 20 seconds. 10. 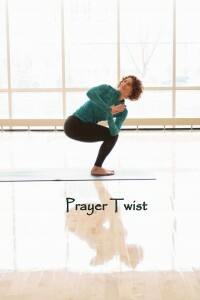 Prayer Twist presents a nice variation to some of the other yoga poses. Start in a balanced position with feet close together if possible, squat into a comfortable yet challenging depth, put hands together, and then try slowly twisting the upper body to one side so that opposite elbow touches the opposite knee. To modify, simply start with the squat position and try to twist even a little bit. Progress is key! Congratulations! You just made it through 10 commonly practiced yoga moves. Keep practicing, and you'll be a "yogi" in no time! And, to learn more poses, join one of our yoga drop-in classes.